The importance of GPU performance is increasing; if it weren't, Intel wouldn't be so feverishly working to bring Larrabee to market and Apple wouldn't have announced a switch away from Intel chipsets two years after adopting them. GPU accelerated applications are finally beginning to get some exposure; Adobe's recent Photoshop CS4 introduction is the perfect example. If more big-name developers deliver GPU accelerated applications that matter, having a higher performance integrated graphics solution becomes more interesting. Things have been amazingly quiet on the Intel chipset front. Once the AMD-ATI acquisition was announced, development on ATI Intel chipsets all but halted as did shipments of ATI's chipsets to motherboard makers - no one was looking to touch that beast with a 10 foot pole. That left Intel and NVIDIA as the only providers for Intel chipsets. We finally got G45 a couple of months ago, but in many ways it was a mild upgrade to G35 rather than the platform we'd all been waiting for. NVIDIA has had its gloves on and eyes set on causing Intel trouble wherever possible, so it's not a surprise that NVIDIA's G45 killer is set up to look even stronger on paper. The GeForce 9300 and 9400 are similar in many ways to the GeForce 8200/8300 from the AMD world, but obviously since we're talking about non-Nehalem Intel platforms they do have a few changes like the inclusion of a memory controller. 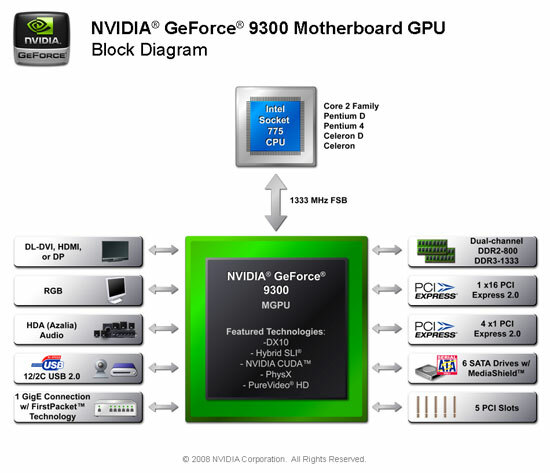 Like their AMD counterparts however, the GeForce 9300/9400 are single-chip solutions and unlike the 8200/8300 they are built on a smaller 65nm manufacturing process. The single-chip design does help enable small form factors as you can get a little more compact with your motherboard layout, but this is mainly an advantage on the mobile side (or with non-standard desktop form factors, e.g. iMac). Built on a 65nm process we should actually see power consumption fairly competitive with Intel's G45, especially given that Intel's ICH10 is built on a 130nm process while the G45 is 65nm. Feature-wise we do get some upgrades over NVIDIA's previous chipsets, exclusively in the graphics department, which we'll get to shortly. Finally, GeForce 9300 boards should be selling for around $100 on average with availability shortly. Where I live, in Belgium, only 3 mobos are available with this chipset: The Asus, the Gigabyte, and now there's a new one from DFI: I'ts called the DFI LANPARTY Junior GF9400-T2RS . So only 3 mobo's... it's what makes me think Apple is eating most of these chipsets right now. And take care of your health. Has anyone seen another mobo? Mr. Anand, any update since the test? Is there a revision 2 which solves the latency problem and so on? I would like to buy one... I have a low power Pentium 4 631 'Cedar Mill' lying here, and I have everything except a mobo. So I am kind of waiting to see the stated issues resolved in a certain mobo before buying one. I like to see NVidia being the leader in INtel-mainstream chipsets again! I'm currently seeing 7 available Nvidia GeForce 9x00 based motherboards available over at Newegg.com - XFX, Asus, Zotac, MSI, DFI, Gigabyte, and EVGA. I've been thinking about picking one of these up for a while, but was hoping for an update from anandtech on whether the problems/kinks they mentioned have been worked out yet. You say that you tried to keep every part of the system the same as much as possible. Why is it then that you choose a 140 Watt AMD processor and a 95 Watt Intel processor and say that the nvidia 9300/9400 is using less energy than the AMD chipsets? You should have gone with something more the same like a 65 watt core 2 duo and a 65 watt athlon 64x2. That way you could be sure that you have honest results. And performance wise it is ofcourse obvious that the intel systems should perform better because of the ridiculously high end processor. Now there is no way of telling wich one is using less energy! What is the ship date? I would be interested to know when these motherboards are available, noone is selling them. I am particularly interested in the MSI board. It is interesting in this article one person has the DTC 9.8 and the other Pioneer Elite. I currently have Pioneer Elite and was thinking about DTC 9.8. For an HTPC use is the upgrade worth it?